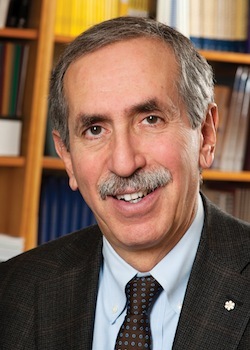 Current president and chief executive officer of the Canadian Institute for Advanced Research (CIFAR) Dr. Alan Bernstein has been a scientist all his life. For more than 30 years, CIFAR has been bringing some of the top researchers in Canada and around the world together to focus on worldwide challenges. It provides a space for sustained, small-scale, intimate conversations between groups of investigators that come from diverse disciplines and perspectives. “We need to take risks,” said Bernstein. “We expect our researchers to take risks. Tough questions are always, by definition, risky. One program concerns child and brain development. “There are about 25 people in that program and they range from pediatricians to fruit fly neurogeneticists, psychologists, epidemiologists, molecular biologists and policy people,” said the doctor. While all of the 25 have their own particular research program, they come to CIFAR to focus on one question, which, in this case, is how do we optimize child and brain development? Fifteen years ago, Bernstein became the first president of the Canadian Institute of Health Research, the national funding agency for health research. It was a job he had to create. Seven years later, he joined CIFAR. When he closed his lab, Bernstein made sure that everybody had a job. Although the transition was quite traumatic for him at the time, he realized he was still a scientist, that he did not need to run a lab to be one. “I was deeply honored,” said Bernstein of being chosen. “It’s a high honor, indeed. I know a lot about the Hall of Fame because when I was the president of CIHR, I had to chair the selection committee.… I had a chance to go to a lot of the ceremonies. For the induction ceremony, a video was made in which some of his former students were interviewed, as well as some colleagues from his time at CIHR. “Sir John Bell, who’s a Canadian, but also the Regis Professor of Medicine at Oxford University – a very accomplished, very senior guy in the global medical scene – also said some nice words about me,” said Bernstein. What Bernstein found most moving about the video was the message that it conveyed – that the most important legacy a scientist leaves behind is the training of his or her students.